Ellen Icochea was born in July 1967 amidst the space race and Apollo missions. Ellen remembers adults always being excited about the launches, crying during the tragedies and patriotically welcoming the astronauts back to earth. Ellen didn’t truly understand the magnitude of the Space Program and its meaning to Americans until she attended the Challenger Space Shuttle Launch on June 18, 1983. She felt connected to Sally Ride’s accomplishment as a major step forward for women. From that point on, Ellen became obsessed with NASA operations, Astronaut (Auto) Biographies, and Commission reports. She wrote a paper in my Master’s Program about NASA management. Ellen believes that the Astronauts are the last true explorers. When the opportunity to participate in the Fly Me to the Moon challenge arose, she felt compelled to enter. After completing Captain Lovell’s face, Ellen became ill and artist Jayne Gaskins kindly agreed to share her talents and completed the quilt. 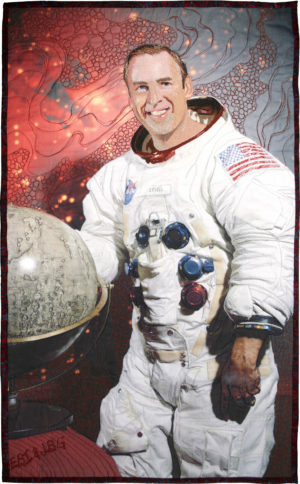 It is an honor to have co-created a fiber art portrait of Captain James A. Lovell, Jr. who valiantly and creatively faced life threatening issues in Apollo VIII and XIII in order to successfully return the astronauts to Earth. Captain Lovell’s face is densely blended and thread painted. The remainder of the quilt is thread painted and quilted. Cotton, duck canvas, batting and thread.